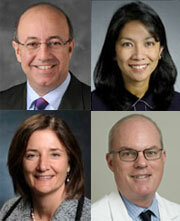 The American Board of Surgery launched a new website in February to better serve our various audiences. The new website is designed to work equally well on a desktop computer, tablet or smartphone. The new design also features three color-coded areas to address the needs and interests of the majority of our website visitors: Training & Certification, Maintenance of Certification, and For the Public. 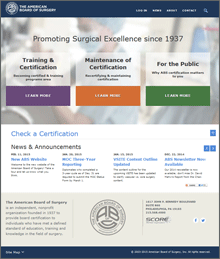 Visitors can also easily check a surgeon's certification status right from the homepage. Over the past several months, the ABS has been working to improve the log-in area of the ABS website, especially for diplomates looking to check their status with the ABS Maintenance of Certification (MOC) Program. Diplomates can now check their MOC status at any time by going to moc.absurgery.org. Once logged in, diplomates can see their current MOC status, latest MOC cycle, and next MOC reporting period, as well as view their personalized MOC Timeline. Further improvements are planned in the months ahead to make this area as user-friendly as possible. Stay tuned! A minimum of 25 cases as teaching assistant will be required of applicants completing residency in 2014-2015 academic year or thereafter. A minimum of 250 cases by the end of PGY-2 will be required of applicants who began residency in July 2014 or thereafter. Completion of the ABS Flexible Endoscopy Curriculum will be required of applicants who complete residency in the 2017-2018 academic year or thereafter. Further details about the above requirements can be found on the ABS website under General Surgery Training Requirements.